We’re thrilled to finally unveil our sleek new uniforms, which will be debuted at our home game against Sheffield Crucibelles on June 21. The uniforms were designed by the Cats to reflect the athletic look of our previous sports tops, and features our fabulous Riot-Not-Diet designed logo. It’s taken the best part of a year to get the design perfected, with the whole league involved, and comes just after we celebrated our fifth anniversary in April. The tops also include the logos of the team’s sporting partners, Wakefield Trinity Wildcats and the Wakefield Community Trust. Cats’ captain Kirsty ‘Fu’ Quinn said: “The new uniforms have been a long time coming and add a real boost of confidence to the team. “We’ve just celebrated our fifth anniversary, and as we’re taking a more serious approach to training, it felt right to take a more modern approach to the branding of the team and our uniform. Tickets are already on sale for the game, which takes place at our home venue, Dewsbury Sports Centre. 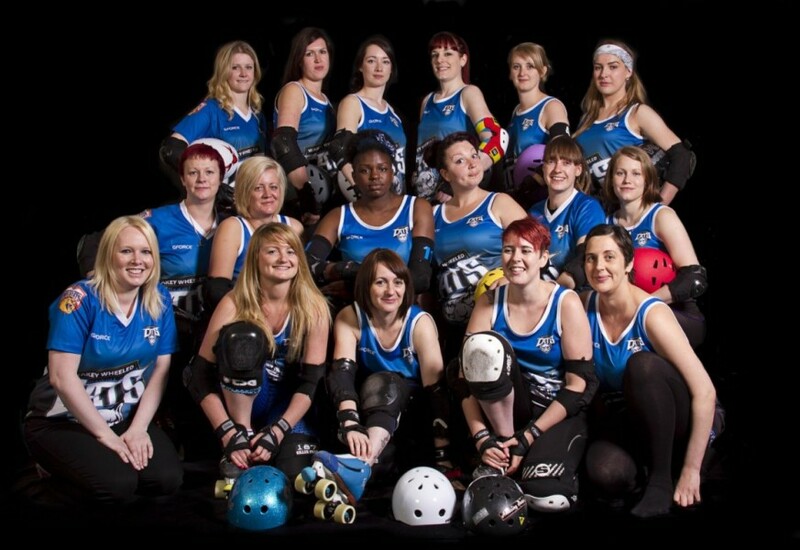 It’s the second time we’ve met on track, with the Crucibelles taking the win in a closed game in Sheffield last autumn. Both the Cats are eager come out on top, boosted by May’s 226-74 win against Barnsley Black Heart Rollers. Fu said: “It was a convincing win that improved our European rankings by 50 points – but Sheffield are an experienced team and they showed us that last time we met on track. “We’ve been training hard and are looking to build on a successful start to our playing season. In celebration of partnership with the Wildcats, anyone wearing a Wildcats or Wheeled Cats t-shirt will get a special discount when buying tickets on the door. Buying a ticket in advance also saves you cash – leaving you with more money for merch. Get yours here. Thanks to Kaboom Images for the photographs.